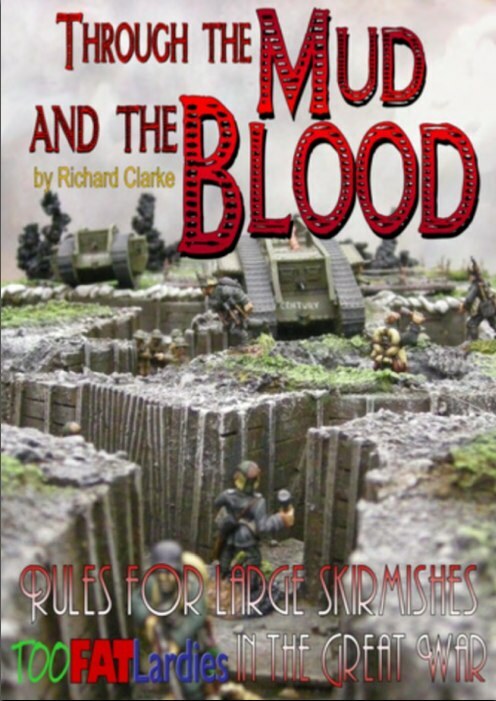 Tonight at the "club" Steve & Martin had a game of "Through the Mud and Blood". 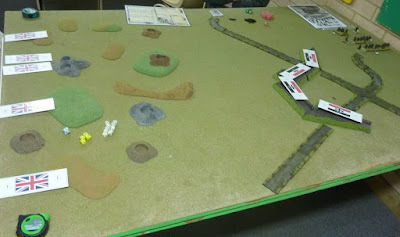 This is a WWI game using individual figures. I was mainly a spectator of sorts, providing unwanted tactical advice at various critical points. However, I did provide the figures for the German side, with Martin providing the British. Steve provided the cards, blinds and extensive knowledge of the rules. The game was scenario 1 from the rules. It is an introductory scenario, with small forces. I had played this before with Steve, I was the Germans and lost. Steve since that time played the same scenario three more times, and every time the British won, mainly as they have more numbers and more commanders. So here with his 5th attempt, the challenge was to see whether the Germans could win. Steve took the Germans, Martin the British. Below is the initial set up. Both sides deploy with cards. 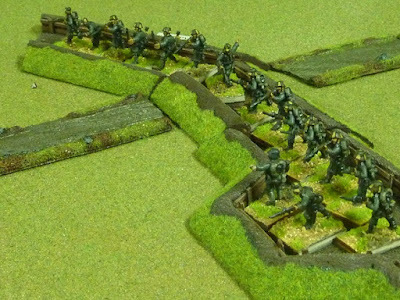 The Germans start in trenches, whereas the British are attacking, coming in from the board edge. It was an interesting game, initially the main British command stayed back out of harms way (thanks to bad movement dice), which meant the advance was not that well co-ordinated, and units fell back in shock from the German shooting. The consensus was that a German victory was possible at this point. However, as this scenario tends to turn out, the British command (called "big men" in the rules) got its act together, rallied the troops and they slowly wore down the outnumbered Germans for another British win. The rules are interesting in that they simulate difficulties in command during the era, and also the suppressive effects of firepower. Units can take casualties or accumulate "shock" points - and shock points reduce movement and shooting ability unless rallied off. A lot of shock points will force a unit to fall back.